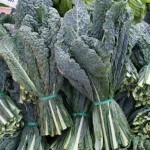 High in iron and minerals, dino kale is a powerful vegetable. Couple it with cranberries packed with anti-oxidants and you have a healthy and tasty side dish. Heat a large sauté pan over medium heat. Add the olive oil, red pepper flakes and cranberries. Stir 10 seconds, and add the kale and 1/4 teaspoon salt. Sauté until tender. The water that adheres to the greens should be enough water to cook them. If needed, add 1 tablespoon of water to finish cooking.